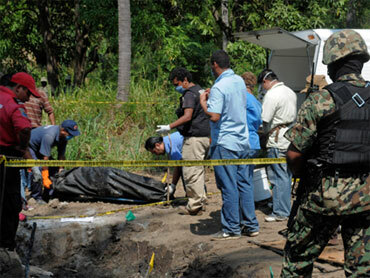 In another grisly turn in Mexico's drug war, police have recovered 18 bodies from a mass grave announced in a YouTube posting - a video saying the victims were from a tourist group kidnapped in Acapulco a month ago. Hours earlier, a video appeared on Youtube in which two men - their hands apparently tied behind their backs and answering questions from an unseen interrogator - say they killed "the Michoacanos" and buried them in the area. A sign left between the two men read: "The people they killed are buried here." It was signed by Acapulco's Independent Cartel, or CIDA - a little known drug gang that has been claiming responsibility for killings in the area over the last two months. In the video, the two men say they killed the "Michoacanos" in an act of revenge against La Familia, a powerful drug cartel based in Michoacan state. Hundreds of the men's relatives and friends have twice marched in Morelia to demand federal authorities investigate the case. "To the people who have them, we ask them to have mercy on them, on us," Katy Rodriguez, a niece of seven of the missing men, said in a message sent to the captors through the media. Videos like the new posting on YouTube have become a new dimension of terror to Mexico's bloody drug war. Cartels are increasingly releasing video of kidnapped people admitting at gunpoint to crimes ranging from extortion to murder. It is often impossible to determine the veracity of confessions given under duress.